Nigerians fleeing Boko Haram violence at home and seeking refuge in Cameroon border towns are still not safe. Since June over 1,500 Nigerian families have crossed into Cameroon where they are mainly sheltering with host families or in local mosques, churches and schools, but following renewed Boko Haram attacks, some of these schools have been destroyed and refugees have had to flee further into Cameroon's interior. Local officials and UNHCR estimate 43,000 Nigerians have fled to Cameroon over the past year, including 26,753 refugees registered by UNHCR. Since 15 September, 13,900 Nigerian refugees crossed into Cameroon and Chad while in August 15,000 refugees and returnees arrived in Niger's Diffa Region. In Mora, 1,733 Cameroonians and thousands of Nigerians are sheltering in local schools and mosques, while in Kolofata, about 5,000 people are living in similar conditions, according to Babila Akaou, the prefect of Mayo Sava Division. Nigerians are arriving hungry, exhausted, with wounded feet from the long journey, and with a high rate of respiratory infections among the children, according to Babar Baloch, UNHCR spokesperson. UNHCR and its partners are calling for more funding to boost the response to the growing refugee crisis. Some 75,000 people have fled Nigeria to Cameroon, Chad and Niger over the past year, they estimate. "We thank the Cameroonian authorities for accepting us on their land. Despite the fear of Ebola, the government of Cameroon has let us cross the border. I come from the village of Kerawa. We were attacked in the village by Boko Haram and I don't even know where my two sons could be found today," John Shetima, a refugee in Kolofata, told IRIN. Lydia Ali, another refugee from Goza in Borno State, Nigeria, told IRIN: "Life is hopeless. My village is now in the hands of Boko Haram. People ran away and some people were killed, and some were captured by Boko Haram. We feel safer in Cameroon." Refugees told UNHCR that insurgents had attacked their villages in the areas of Gwoza, Bama, Pulka and Idagala in Borno State, and stole everything before burning their houses. The refugees escaped, walking for days until they reached Cameroon. The villages remain mostly empty on the Nigeria side, with only the old and disabled remaining. Over the past few days the UN Refugee Agency (UNHCR) has been transporting refugees living in schools and mosques in and around Kolofato to Minawao camp 120 km inland, while security is being enforced to reduce further attacks inside Cameroon. The population of Minawao camp has more than doubled to 13,900 since August, incurring an urgent need for more tents, toilets and water points to be built, said Muhamat Alhidi, the camp site planner. Refugees there complained to IRIN of a lack of sufficient food, water and tents. Refugee Judith Yagane told IRIN: "We have not had water for five days. We have just a little to drink each day but not enough for all our needs." The health situation for refugee infants and children is a concern for UNICEF and other health agencies. According to UNICEF's Wally Badiane, one quarter of refugee children are chronically malnourished and 2 percent have severe acute malnutrition. Severe cases are transferred to the Mokolo district and Jagala health centres where UNICEF is providing them with therapeutic food and wider healthcare support. Conflict between Boko Haram militants and the Cameroonian military has abated over recent weeks since the assault on the Cameroonian town of Fotokol on 26 August, when 40 Boko Haram militants were reported killed and one member of the Cameroonian military injured. Military sources say fighting between Boko Haram and the Nigerian military is ongoing in villages in Nigeria not far from the Cameroon border; in one of those attacks the Nigerian military was forced to retreat into Cameroon territory before being escorted back to Nigeria, according to Cameroon army spokesman Lt-Col Didier Badjeck. Most of the newly arrived refugees are women and children arriving on foot with the possessions they can carry. They have little food or water, according to Akaou. "The whole community is in serious stress. Children are not able to play around because of hunger," he said, adding: "What we can do, as the administrative authority, is to provide these people with basic needs while waiting for more humanitarian assistance from development partners and humanitarian bodies." Some of the refugees who arrived in Kolofata moved 45km further south to the relative safety of Mora where they hoped to get help from aid agencies. In the past month, local health authorities in Mora have reported a high caseload of children with malnutrition, diarrhoea and dehydration, and there are fears of a cholera outbreak. Cholera in Cameroon's Far North Region has killed about 200 people and affected thousands since June 2014. Water and sanitation facilities for people living in the government primary school in Kolofata, where about 1,000 refugees are sheltering, are very poor. Boko Haram attacks in Cameroon have destroyed many homes and schools in the three affected localities of Maya Sava, Mayo Tsanaga, and Logon and Chari divisions. Authorities estimate that, about 5,000 internally displaced persons (IDPs) have fled to larger towns in the affected areas. "Since fighting started, we have not been in peace at work, but these recent attacks extended right up to the village where I was working and students do not even want to start school," said Francis Jabi, a primary school teacher in Mayo Savo. Jabi said he decided to stay in the town of Maroua rather than risk his life by going to his duty post in Kolofata. 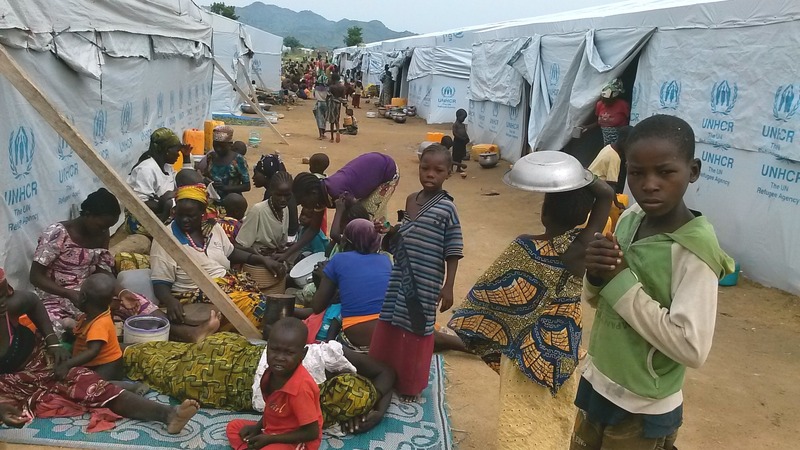 According to the authorities in Mayo Tsanaga Division, three villages were destroyed by Boko Haram in August and about 700 IDPs from Buorrha, Mayo Muskuda and Mogode villages are now camping in neighbouring villages, together with about 800 Nigerian refugees. With humanitarian needs expected to continue to rise, the local authorities and UNHCR are planning a new camp near Minawao, said Raymond Roksbo, the prefect of Mayo Tsanaga. "We are working with UNHCR on how to manage this crisis. We have made available a large piece of land for another camp close to Minawao," he said.